Who Steals A Taco Cart? Ever have those nights when you're really hungry and wish there was a taco cart next to your house where you could buy delicious, delicious tacos to feast upon at 3 a.m.? Sure. we all do. But one Brooklyn neighborhood doesn't get its tacos tonight because some asshat stole Rogelio Gonzalez's taco cart. 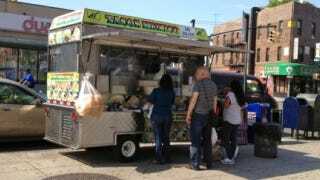 Even worse than the plight of the neighbors is that of Gonzalez, who used his life savings of $28,000 to buy the truck so that he and his two eldest sons could sell traditional Mexican food in Brooklyn's Ditmas Park neighborhood. The Gonzalez family slaved over a hot burner day and night for a largely appreciative crowd, but someone had to go and ruin it for everybody. The neighbors are pissed because they can't get tacos whenever they want. Gonzalez and his sons have reached out for help on Facebook, and community members have been blogging about the theft, but the cart hasn't been found yet. Unbelievably, Mr. Gonzalez is taking this all in stride, telling NY1, "I don't want nobody go to jail. I want everybody OK. Please leave the cart on the street." Whoever the taco cart banditos are (could it be the same delinquents who stripped this old van), stealing someone's life savings and depriving an entire neighborhood of tacos is punishable by death in some corners of the world. You should give the man his cart back.